Ring any bells for anyone? 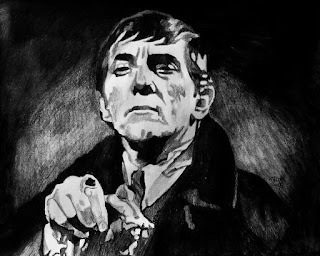 I was a smidgen too young to follow it closely, but those were the words that every weekday starting in 1966 opened the 30 minute daytime soap opera Dark Shadows. Women in my family did not watch it, but I remember playing at a neighbors' house and her elderly grandma watched it faithfully every day. It spilled over into my consciousness and that "wooo oooooo" music of the title frames, and the sort of crooked words "Dark Shadows" superimposed over waves crashing over rocks seeped into my head. Oh joy oh raptures. Thank you Netflix. You can get the episodes of Dark Shadows on DVD. Lots of them. Really lots and lots of them. More than 1200 episodes. Wonderfully campy, shot in one take on video tape. And absolutely riveting. Talk about complete suspension of disbelief. Talk about quirky. Dear One and I are hooked. Each episode is 20 minutes long and the original commercials are edited out. Classical drama? No..... Best of acting? No....... Just escapist fun and good character development. 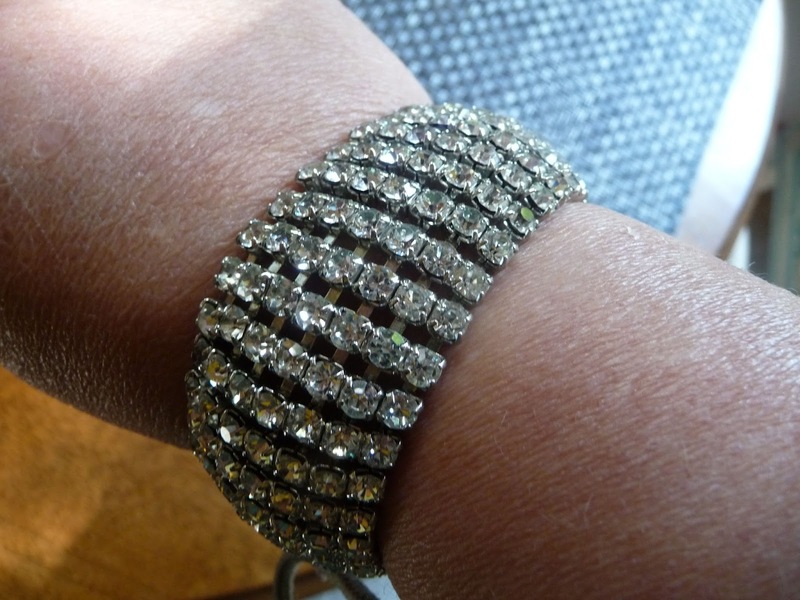 How Many Rhinestone Bracelets Does One Woman Need? Today is the day that I have attacked my costume jewelry box. Really Lady Antique Dealer? 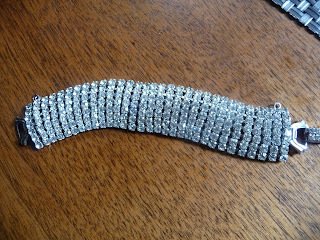 Five rhinestone bracelets? Time for Ebay. Dear One gave me one I love. My mother gave me one I love. And three more from a variety of other sources. The three have to go. I wear the jewelry during 6 weeks around Christmas and New Years. It is like keeping special kitchen widgets for the one time a year you use them. No more of that. The three gotta go. After all--I only have two wrists for two bracelets, right?? The one pictured here is vintage marked Weiss. It is lovely--but time to move it on. It does not give me joy to wear it--and holds no nostalgia. 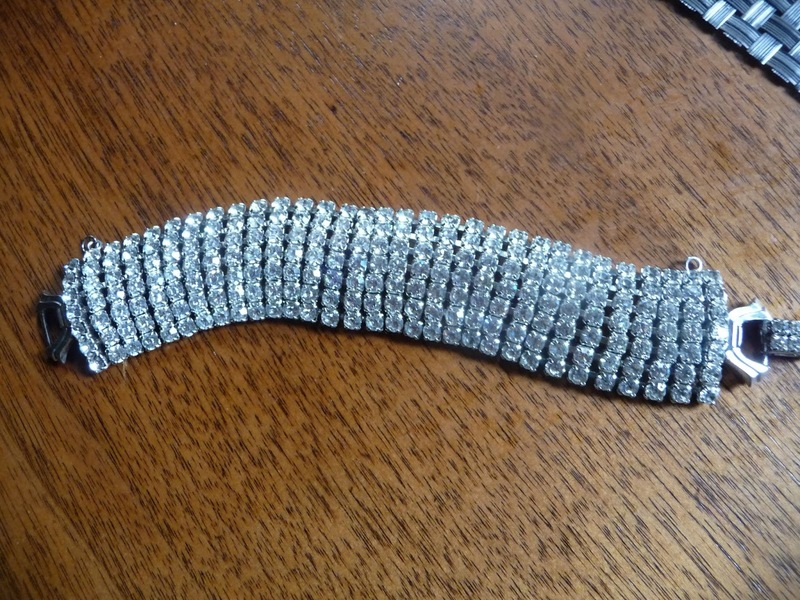 Just listed it on ebay under my selling name SELLINGLIKECRAZY. Starting price $49.00. I would be lying if I said that selling antiques was all about only fabulous one of a kind merchandise. 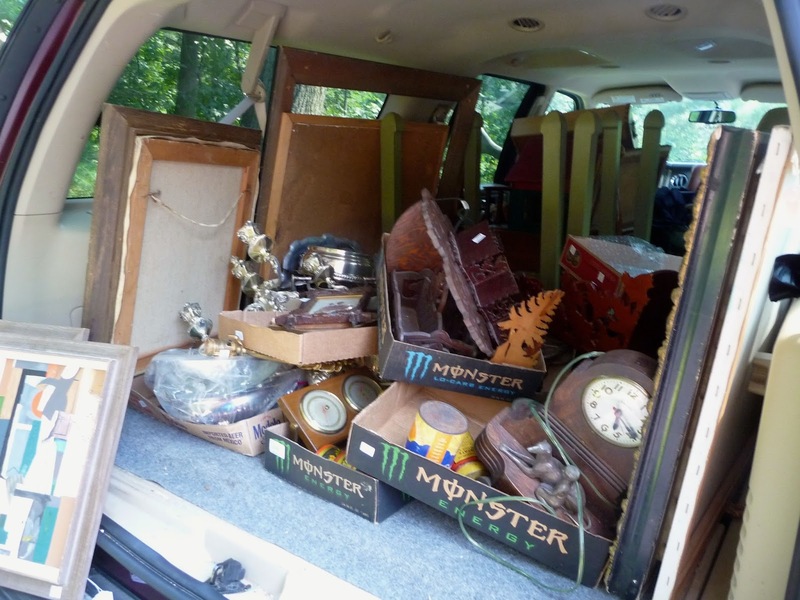 Sometimes, selling vintage and antiques means selling "just old stuff." All antiquers know what I am talking about. You go to an auction, you bid on good things--and a whole bunch of other stuff comes with it. 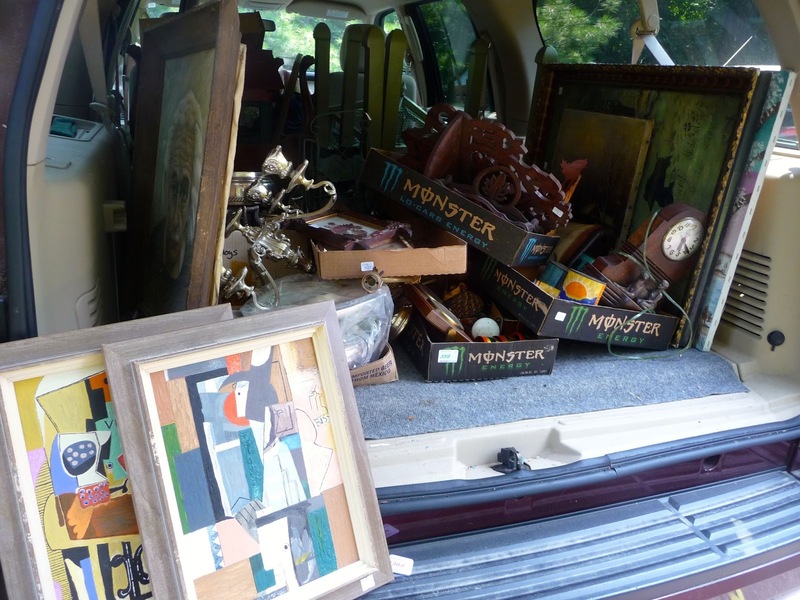 An auctioneer tries to get a bid--does not and lumps a bunch of things together. If you are at a farm auction--you can just leave this stuff, QUIETLY under the farm wagon. Or you can be like me and Dear One. We bring it home. We call that collection "rent makers." These are items you can sell for $50 and under that supplement the less frequent sales of higher priced goods. The normal procedure is for me to sort it on the driveway--before it gets into our storage--with a garbage can on one side of me and a Salvation Army box on the other and an inventory bin taking its designated spot. This may look like a jumble--but that will turn into cash before the end of the month. Come visit our space at Odana Antiques in Madison, or at Elkhorn Market at the end of the month. Always interesting "rent makers."